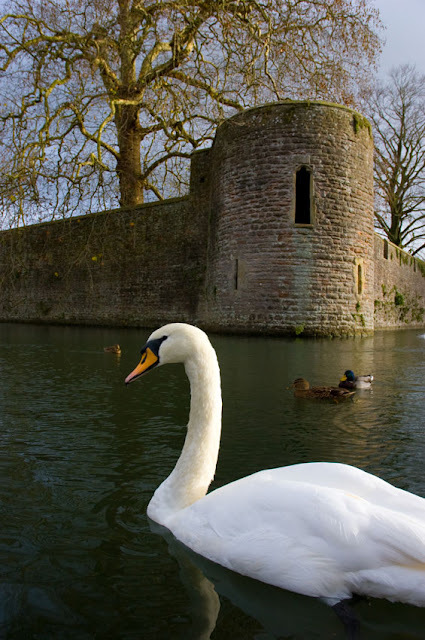 Swans have been synonymous with Wells in Somerset for centuries, where resident swans patrol the stunning 13th century Bishop's Palace, which has been home to the Bishop of Bath and Wells for over 800 years. 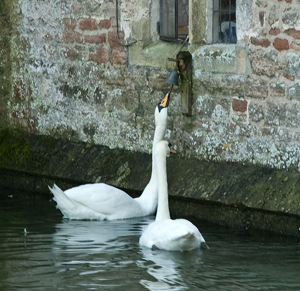 The swans of Wells have the unusual habit of ringing a bell by the Palace drawbridge to ask for food. This unusual spectacle started 200 years ago, when the daughter of an 19th century Bishop taught her favourite swan to ring the gatehouse bell for scraps of food, a technique that has been passed down the swan generations! With swans also traditionaly a royal bird, the trail of 60 stunning swan sculptures will be a very fitting celebration of the Queen's Diamond Jubilee, with each of the 60 swans representing a year of the Queen's reign. The original bell-ringing swan can still be seen today, displayed in a glass case at the Wells Museum! Historically, the crown of England owns all unmarked swans in open waters, however Queen Elizabeth II only exercises her right on stretches of the River Thames. In the past, swans were seen as a delicacy and would be fattened up and served at banquets and feasts. Centuries ago, an unauthorised person caught killing a swan could be sentenced to transportation for seven years and even up to 1895 people could be sentenced to seven years' hard labour. 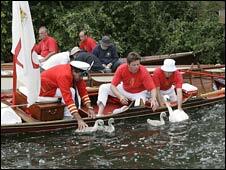 The first Royal Swan Keeper was appointed in the 12th Century and today the swans are looked after by the Swan Marker. The birds are rounded up during Swan Upping, a five-day census of the River Thames's swan population, when the new season's cygnets are marked and counted. 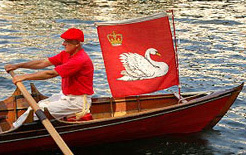 While carrying out the Upping the Queen's Swan Marker and Uppers wear scarlet uniforms and fly a royal flag from their boats. As they row past Windsor Castle they stand to attention in their boats with their oars raised in salute to the Queen. Swans of Wells 2012 was a major tourism initiative for Somerset, which featured the public display of sixty, magnificently decorated, 5ft swan sculptures, one for each of the sixty years of the Queen's reign. The flock was displayed in locations around Wells and the surrounding Somerset countryside for 3 months this summer, from June to September 2012. This eye-catching, high profile event brought thousands of visitors to the streets of England's smallest city and a smile to the faces of all who saw them. The swans were sponsored by businesses, individuals and organisations and decorated by a team of talented artists and craftspeople from across the West Country and beyond, who transformed the impressive, avian canvasses into beautiful works of contemporary art. After gracing the streets of the historic city for the summer, the swans were rounded up in early September and displayed in one giant flock for the 'Swansong Auction Preview Weekend' at the Bishop's Palace in Wells, attracting over 10,000 swan fans who came to say their final farewells before the 'Swansong' charity auction on 29th September, which was broadcast live online and brought in bids of over £110,000. 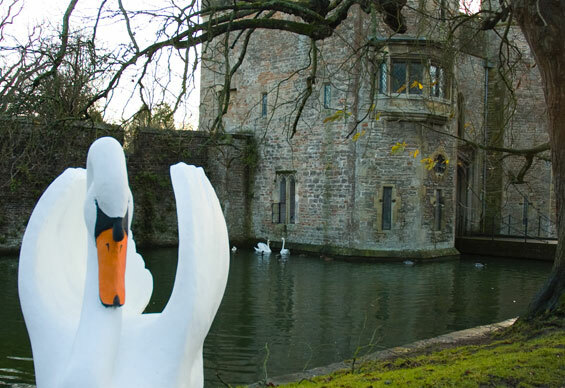 Swan artists receive 25% of the auction sale price of their swan sculptures and all net profits from the 'Swans of Wells 2012' event will be donated to local Wells charities. Designed by Walker/Jansseune. Powered by Blogger.